“We know now that prehistoric times were not grey but rather that prehistoric houses were colourfully painted,” Saxony-Anhalt state archaeologist, Harald Meller, said. 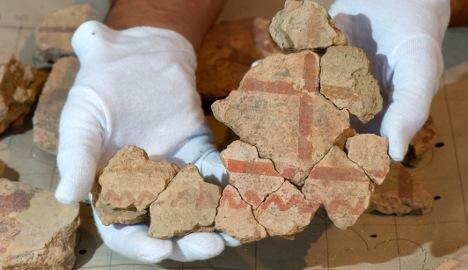 It was the greatest Iron Age wall painting discovered north of the Alps, he said. The dominant colours are red, beige and white. For pigments, the prehistoric painters used substances such as iron oxide, which gives the reddish, ochre colour. The design shows typical ornamental patterns from the Iron Age such as triangles and S-shaped hooks, but also symbolic characters. “The painted wall possibly decorated the front of an important house,” Meller said. Archaeologists discovered the wall two years ago during an excavation of the site for a new high-speed train line, near the village of Wennungen, about 40 kilometres southwest of Halle. The wall had been broken up into about 1,500 individual pieces over time. Experts have spent much of the past two years putting the pieces back together like a giant jigsaw puzzle. The final product is a section of wall two metres long and 1.5 metres tall. The prehistoric site near Wennungen was spread out, once covering a piece of ground the size of more than 200 football fields. One piece of the wall will be shown from 2012 as part of a permanent exhibition that also features the famous 3,600-year-old Nebra sky disc, a bronze object about 30 centimetres in diameter depicting celestial bodies in gold on a blue-green background.